The picture below is a fairly typical shot from a Patrick Keiller film. 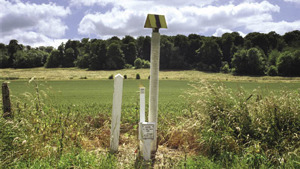 The roadside marker indicates a Government Pipeline and Storage System (GPSS). In other words, running beneath this scenic spot is the kerosene for US warplanes. Keiller started as an architect. He makes his films extremely slowly and spends most of his time doing other things (teaching, writing). Perhaps that’s why he doesn’t sound like a filmmaker. He describes his film London (1994) as ‘a sort of polemic for the necessity of continually re-imagining our surroundings’. Its fictional anti-hero, a man called Robinson, has had two more outings in Robinson in Space (1997) and Robinson in Ruins (2010). ‘To endow with poetic value that which does not yet possess it’ was an aim of the surrealist filmmakers. It’s something that Keiller has gone on taking to heart. The camera is generally motionless. It observes and the world it reclaims is indeed one we haven’t fully ‘imagined’. Take the gigantic distribution centres which regulate the flow of goods: how many of us ever really look at them? The second largest port in Britain is somewhere called Immingham. It imports millions of tonnes of coal and iron ore each year and nowadays, as Robinson wryly observes, this ‘involves very little labour’. It is from such places that Britain exports weapons all over the world, but who has ever heard of Immingham? In whose interests is it that we have no mental image of it? A recurrent Keiller theme is the erasure from England’s ‘smiling and beautiful countryside’ of its ‘dreadful record of sin’. His character Robinson studies the enclosure of common land from the 1590s (together with the torture and execution of those who opposed it) to the 1830s. He reflects on the deliberate creation, during the industrial revolution, of a dispossessed rural population, ‘in the interest of freeing up hands to go where burgeoning capitalist enterprise needed them most’. Indian rice farmers, take note. These questions are not ‘settled’. Who really owns Britain, even today? US airbases, many built on requisitioned land, are supplied by a network of oil pipelines in which Robinson displays a keen interest. Imprisoned for attempting to trespass on a factory where fighter-planes are awaiting export to Saudi Arabia, his action is situated within a long tradition of resistance. In Keiller’s imagery, music and soundtrack, the playful and the barbed, the erudite and the nerdy take their turns. Facts and quotations, statistics, the fluctuations in oil or wheat price, butterflies on some teasels: it is with these that Keiller performs his re-imagining. The national and global public whom his installation at the Tate will be addressing in the year of the London Olympics is unlikely to come away consoled. But wherever the viewer is from, ‘home’ will never look quite the same again. Patrick Keiller’s work will be on show at a multimedia exhibition at Tate Britain from 27 March until 14 October.